the conductor confided to a friend. The remark was not unfounded. A streak of hazardous weather was still in force on December 29, 1901, as passengers boarded the westbound train at Union Station in Lynchburg, Virginia. Several were headed for the village of Holcomb Rock in Bedford County, where the Wilson Aluminum Company had recently built a plant. 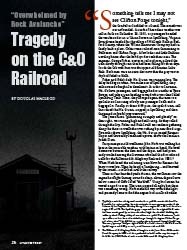 Others were railroad men commuting to Buchanan and Clifton Forge. A few ladies and little children traveling home after the holidays also took their seats. The engineer, George Fisher, a veteran railroad man, piloted the train slowly through rain that had been falling for three days. Inside the cab with him was thirty-year-old fireman Luke Rule. Both men were on extra alert now that the grey winter sky had faded to black. Fisher and Rule’s daily No. 9 train was running late. The delay had begun when, two miles east of Lynchburg, they encountered a freight-car derailment. In order to continue, No. 9’s crew, passengers, and baggage had to transfer at Tyree Station and take a train heading toward what was then called Lynchburg Tank. There, they changed again, this time to a special train consisting of only one passenger coach and a baggage car. Finally, at about 6:00 p.m., the special train, still considered the No. 9 train, stopped in Lynchburg and then continued its fateful way westward. The James River, “glimmering strangely and ghostly” on their right, was running high and still rising. As they rolled through the city, Fisher and Rule could see residents gathering along the shore to watch the river rushing by, near flood stage. Five miles above Lynchburg, the No. 9 train passed Reusens Depot and cautiously continued upriver, above the canal-era Judith Dam. Three or four hundred yards distant, the watchman saw the engine headlight coming around a sharp, eleven-degree curve below a series of cliffs called “the bluff.” Using his lantern he waved a signal to stop. The train stopped all right, but there was something wrong. Nash made his way toward the light and presently came to find the engine had struck a boulder that had fallen in the middle of the track. The front wheels had jumped off the rails; otherwise, there was no major damage. Fisher and Rule were looking at the engine when the watchman reached them. The engineer said to Nash, “John, you see what we have done? We struck the rock about the time I spied your light.” Rain continued to fall as the men discussed the situation. They decided that Nash and the brakeman, Charles Gordon, would walk back toward the dam to wire a report of the incident to the section foreman. As a teenager, local history researcher and writer Douglas MacLeod fished in the deep waters at the location of the rockslide, in an area known as “the bluff.” By chance, while looking through old newspapers, he was astonished to discover what took place there more than a hundred years ago. MacLeod has written for Lynch’s Ferry magazine, Virginia Canals & Navigations Society, and Bedford County publications: Bedford Villages Lost and Found, volume 2; Bedford Images, volumes 1 and 2; and The Mills of Bedford County, volumes 1 and 2. 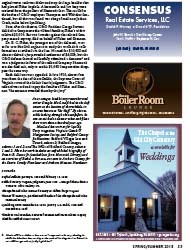 His other work includes an unpublished biography of Francis B. Deane Jr. (available at Jones Memorial Library) and an overview of Bethel, a batteau-era town in Amherst County, for the Davies Family Newsletter and Amherst Museum Newsletter.